You are here: Home » Thinking » Which 1 are you of the 4 Meeting Mindsets? We have all been there, the off-site meeting where plates of bagels and muffins and the cups of coffee from the buffet are clinking and clattering as we settle into our seats to discuss how to build our business. But aside from the quality of the catering, the success of the meeting will have much to do with everyone’s mindsets, and the way they show up in the room. The Vacationer. This tends to be somebody who sees a meeting or a training session as an opportunity to get away from their daily routine and the busyness of their lives. For all practical purposes, they see it as an opportunity to relax, maybe even tune-out. They’re “The Vacationer” so they’re not really focused on anything much at all, let alone the real purpose of them being there. 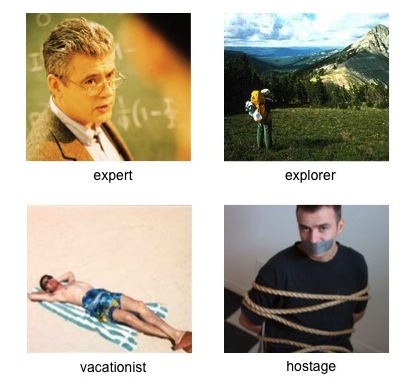 The Hostage. This individual is told to attend the training or the meeting (often by management) and they go, but unwillingly. They would much rather be tending to the things that they need to accomplish. In other words, there are more important things to do. From a posture standpoint, their back is straight, their arms are folded, and their mind is elsewhere, perhaps even thinking of an escape plan. The Expert. This is a person who shows up to the meeting with the mindset that they already know everything. Simply put, there is no new content to be learned and they view the meeting as a waste of their time. On the other hand, it will be a great opportunity to demonstrate how much they know. The Explorer. The Explorer has a natural curiosity and is willing to learn more, to be open minded, to share with others and to listen. Generally, Explorers are people who are creative and value collaboration. They are comfortable with “being in the fog” and not always having the answer. In fact, they view the unknown as a welcome opportunity to achieve a breakthrough solution to a complex challenge. In any group creative problem solving session – which is what a meeting usually is – it is important for the team members to be in an Explorer mindset. Why exploratory? Because if you already knew the answer, you would not need to be there. When the rigor of implementing solutions comes, expertise is important. But, exploration is the key to new grounds. So how do you get a room full of explorers? For the individual: It starts by asking oneself, “How am I showing up at these meetings?” “What is my mindset?” “Where am I in terms of the quadrants?” and “Where do I need to be in order to have a more productive outcome?”. Open your mind to what is coming, suspend judgement, and seek value in what you are hearing, even if the idea is not fully formed. There is the seed of a solution in any idea, and if you are open to it, and explore it, you will find that seed. If you are an expert, this is a great opportunity to help the idea grow. Explorers have a ripple effect on the rest of the team. For Leadership: The selection of innovation and creativity team members is an early opportunity to demonstrate open-mindedness. When selecting team members to be part of a problem solving meeting, it’s not about soliciting a homogenous group from one department, nor is it about gathering the senior leadership team. Diversity is key. Therefore, leaders should be in an Explorer mindset during team selection and choose individuals who they think love a challenge, who is enthusiastic about working together to solve a problem and are committed to activating that solution. Job titles don’t matter in this situation. Everybody should feel as if they’re on an even-playing field, able to contribute without fear or judgment and having management model that kind of behavior is immensely helpful. For the Facilitator: The role is to maintain the type of climate that allows people to really feel as if they are in a space where they are free to express themselves. 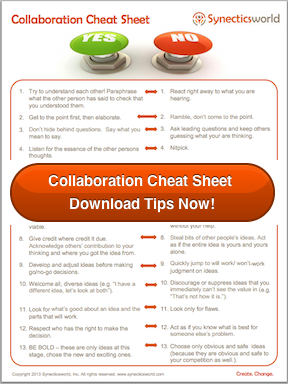 Free to share different ideas, take risks, be courageous, etc. ; to not be afraid to be wrong, because every idea while not necessarily the solution, brings the opportunity to go down a new path, to find new solutions. The facilitator must create and maintain a “safe” environment and a climate for exploration. Our experience shows that it is effective to simply sharing these different mindset types at the beginning of a meeting – particularly in a group creativity and innovation meeting – and this can help move people over to the Explorer mindset, if they’re not already there. Of course, having a great climate for discovery is also critical to how our mindsets can evolve. The next time you are in a meeting ask yourself what mindset am I in, and seek to explore.